The fields of southern Pennsylvania are no stranger to painful battles, but that doesn’t make the state’s latest invasion any less alarming. Palmer amaranth weeds are spreading through the southeastern counties of the state. They won’t take any lives, but they may shrink profit margins in the years to come, Pennsylvania State University weed scientist Bill Curran told farmers at an agronomy and weed field day in central Pennsylvania on Tuesday. Palmer amaranth has claimed territory in the counties nestled against the Maryland and New Jersey borders such as York, Lancaster, Berks, and Chester. The weed populations, which are resistant to glyphosate and ALS herbicides, aren’t likely to stay in their corner, Curran warned. “Right now, a lot of people don’t see it yet, but in another month from now, it will be above the beans and they’ll realize that they have it,” he said. Pennsylvania fields are just another conquest on Palmer amaranth’s relentless march north. The first instance of glyphosate-resistant Palmer pigweed was confirmed in Georgia in 2005, and populations spread quickly across the southern states. So far, scientists have documented resistant populations of the weed as far north as Nebraska and Michigan, as far west as California and as far east as New Jersey. You can see maps of Palmer pigweed’s spread and herbicide resistance in slides 2 and 14 of this presentation from University of Missouri weed scientist Kevin Bradley:http://bit.ly/…. Unlike southern growers, northern states have had time on their side. University Extension scientists across the Midwest and eastern seaboard have been vocal about the dangers of Palmer amaranth, which can produce up to 600,000 seeds from just one female plant. They’ve stressed over and over the need to treat weeds when they are under 4 inches tall with aggressive pre- and post-emergence herbicide programs that use multiple modes of action. The message seems to be sinking in. Curran’s field day drew a crowd of farmers eager to examine the university’s herbicide efficacy trials. They were a cheerful crowd, but they grew sober and serious when asked about Palmer amaranth. 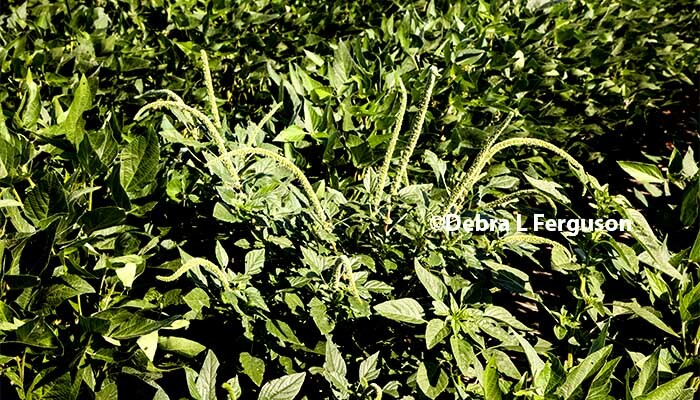 Palmer amaranth’s most recent conquest is PPO herbicides. Resistance to this class of chemicals has been found in southern states like Arkansas, Tennessee and Mississippi. As a result, many are turning to Bayer’s Liberty Link crops, which tolerate glufosinate. The weed scientists at Penn State’s field day displayed a number of Liberty Link trials and urged growers to consider adding the trait to their weed management program, in addition to using residuals and rotating modes of action. The machine was developed in Australia, and two machines are now at use in the U.S., one at Penn State and the other at the University of Illinois. With funding from USDA, several universities are doing trials to test the machine’s efficacy against common resistant weeds of North America, such as lambsquarter, common ragweed and pigweed. Palmer Pigweed with seed tenacles in soybean field. Click image to enlarge. For more information on Penn State’s weed and herbicide trials, see this website: http://extension.psu.edu/….